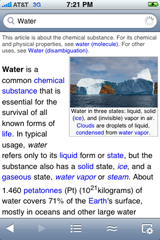 Wikipanion is the best and fastest Wikipedia browsing application for iOS. Wikipanion uses a direct connection to the Wikipedia servers, making it extremely fast. Never deal with overloaded third party servers. Never worry about third party server privacy concerns. Wikipanion understands the page. Wikipanion pulls out meta material from the page, understanding sections and related foreign language pages. Wikipanion meshes the Wikipedia with your iPhone. Get automatic search results while you type. Set your own font size that is saved and applied to every page with no future adjustment. Your last visited page is opened up from when you last left the application.